This project involved developing a programme, the materials and piloting the materials with household food security facilitators in the Eastern Cape. Saide together with Unisa developed the materials and managed the pilot. Funding was received from the WK Kellogg Foundation. 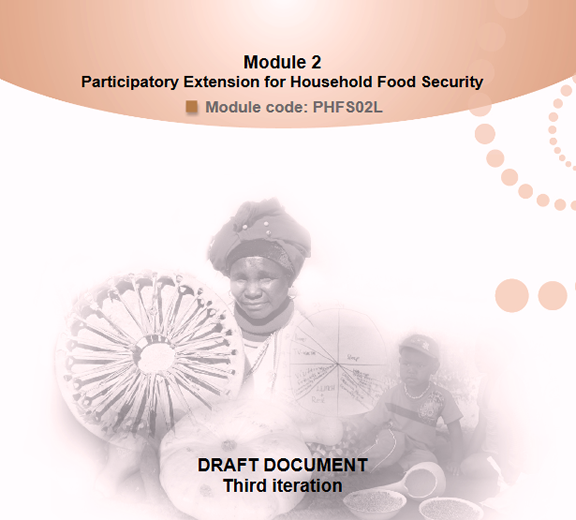 The aim of the programme was to train household food security facilitators to work as change agents in the areas of agriculture, food and nutrition using participatory learning in a structured environment focusing on households within communities. The programme further aimed to improve conditions in rural and peri-urban areas through development of capacity, skills and values within these communities to meet long term goals of sustainable development and poverty alleviation within the context of food security using a sustainable livelihoods approach. Six modules were developed which included tutorial notes. Below are links to the introduction of each module. Clicking on the MATERIALS tab provides access to the associated resources for each module.